This is a real quick one as I have only 20min before I'm due to start work. And I need to go to the supermarket yet to get my breakfast. So far I'm messed around with running PHP on Apache and IIS, and I think I lamented that PHP didn't seem to have a built-in web server option (although whether this made it into an article I'm not sure: I can't find it). Well whilst reading some docs during my KL to London flight last week, I saw mention of a built-in web server, so I decided I'd better look into this at some stage. Once again, Stack Overflow is my muse. Today a person called David Mulder is asking a question the answer to which relates to how CFML source code is processed into a Java .class file before the class file is then executed. Note how I'm raising an exception if the template is a "restricted" one. This sends a "500 Internal Server Error" back to the client. This is incorrect, as the server hasn't had one of those. What I should be returning is a "403 Forbidden", because that best describes the response. But how am I to do this in a script-based CFC? I can't use the script equivalent of <cfheader> because there isn't one (bug 3350715). I recalled there is a function restSetResponse(), but that only works in REST responses (and even then, it hardly works in a useful fashion). I have since raised a bug relating to this: 3546046. Thinking about it further... why is it restSetResponse()? Why is it not just setResponse()? If there's a rationale for this functionality in the response from a REST request, then the same rationale exists for any other sort of request response. This function deals with HTTP, it's nothing specific to REST. I've raised another bug for this too: 3546047 (it's a bug, because it's a stupid inplementation, even if it's by design). And while I'm about it: there's no script equivalent of <cfcontent> either. And that pisses me off too (bug 3133316). Come on Adobe... you need to get all this stuff over into CFScript quick smart. Man... PHP continues to take a back seat with me, as interesting ColdFusion stuff keeps cropping up. Well: my definition of "interesting", anyhow. Today on Stackoverflow I was reminded of a potential "gotcha" that onCfcRequest() brings to the table. One that has bitten me on the bum in the past, has done so with the person on S/O too, and has probably bitten other people too. And the "gotcha" creates quite a gaping security hole in the application if one doesn't deal with it. I've not seen much coverage of this, so I'll detail it here. Should not be able to access this! (Obviously the same logic as per the onRequest() method could be used here too, but I've omitted it for the sake af clarity). OK, great. What's the problem? Which is inside the application. It's not registered as a remote call, because it's not being called remotely! This means that as well as all remote methods, one can also actually access all public methods too (package and private ones are still secure). This is something people don't necessarily realise, so one might inadvertently expose a helluva lot more of one's API than is the intent. YIKES. Basically one needs to look at the object's metadata and check to see if the method being called is remote. If so: all good; if not: block it. So make sure you do this in your onCfcRequest(). Otherwise you could be leaving yourself a bit open. Now I will get back to discussing those PHP tutorials I did at some point soon, but I have a fairly fractured day today, so I don't have heaps of spare time for the blog. So here's a quicky. In CFML, a lot of people have traditionally kept away from CFScript, kinda screwing up their noses at it, and preferring tags for all their code. One of the points that was made in the past that there was a lot of pretty essential CFML functionality that wasn't possible to use in CFScript because it was all wrapped up in a tag-only solution. ColdFusion 9 & 10 (and of course Railo too) have pretty much dealt with probably 95% of the stuff one would want to do in CFML in CFScript now, which makes that reasoning a bit obsolete. This is not exactly what I was intending to do this morning, but - as is often the case - a question on Stackoverflow piqued my interest. In this case, a person needs to get CF5 running on Windows Server 2008 R2, and - seemingly - was having some problems, supposedly with the 64-bitness of their OS. I have the CF5 installer lying around here somewhere, so I decided to see if I could get it to install on my Windows 7 64-bit laptop. I reckon if it installs on Windows 7, there's a good chance of it installing on on Windows Server too. Vainly, I track how many unique visitors I get to this blog each day, and chart a weekly average. The readership is really low - since its inception in July last year, the average is just over 100 people a day - but it's steadily climbing. This year the average has been around the 120-150 mark, but last week spiked to an average of 243. On Monday I had 447 unique visitors according to Google Analytics. My previous highest was 285: that's quite a spike. Obviously that 447 had a big impact on the rest of the week's average: the other days were each just above 200, except for Sunday which is traditionally a very quiet day, with just 80-odd. Still: it seems I'm getting more traffic, which is good. That "Hello World" code from yesterday (dammit... I missed a trick there... it shoulda been "G'day World", for this blog, shouldn't it!) 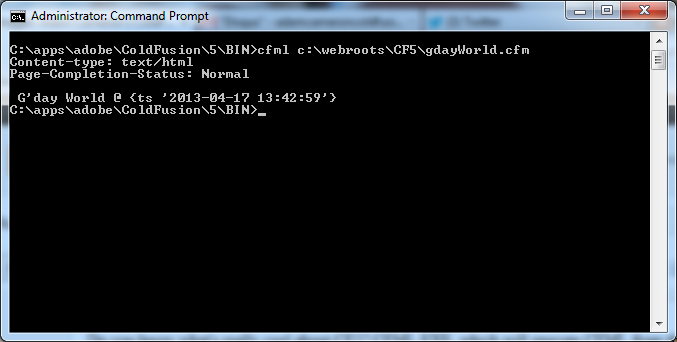 was written using Notepad++, as I didn't have an IDE installed at that point in time. My initial instincts for an IDE was to just use Zend Studio, as my understanding was that it was considered where it's at as far as PHP dev environments go. Then Andrew Myers recommended Netbeans, and I also googled around to see what else was on offer. That was an intentional double negative. This is a follow-up to my article yesterday, questioning why Adobe / Shilpi / Rupesh have said not to use "request-related functionality" within CFThread, and specifically choose to mention this when releasing a security update for ColdFusion 9-10. This makes me concerned as to why they are telling us this. I am moderately confident it was not simply a CFML tip for the community (because that'd be a first, surely, if nothing else ;-), there's a problem they're not telling us about. The guidance was a bit vague, so I've looked into it more. Right, so I'm commencing this process of getting my brain around PHP. First up, I need to get the thing installed on this machine. I had it installed and gathering dust before, but I completely rebuilt this thing recently when I migrated to Windows 7 (from Vista. Go on: laugh), so I need to start again. I am typing this as I investigate. Another community announcement. One that I mean to make a week or two ago, but it kept falling out of my brain. Anyway, one of my mates from work - Marcos Placona - has had some of his work actually publishing in a real book: "Instant jQuery Drag-and-Drop Grids How-to". I reckon that's pretty impressive. Anyway, support your fellow community members and give it a read. Congrats, Marcos. This might be old news to everyone, but thanks to a tip from one of the CF people I "follow" (how stalky that sounds. Probably more so now that I point it out) on Twitter - Carol Hamilton - I "discovered" a ColdFusion blog I was previously unaware of. It's by Summer S. Wilson, and called ColdFusion Beyond. I've read a coupla articles, and have found it pretty interesting and with an engaging writing style. Plus she mentioned a curious bug that has piqued my interest, except I've not investigated yet. I've had a reasonable number of results on my survey asking whether or not you use onApplicationEnd(), and if so: how so. It's telling a predictable story: the answer is "no, not really". I've had 42 responses, and 38 of them are "no". Current application uses onApplicationEnd to write to a log file that the application has shut down. for some projects I work on we have to do audit records almost everything. So that's one of the things that's triggered on Applicationend. Other stuff I've used it for was for general cleanup of data. I've used this to clear a shopping cart for a reservation app. I'm not convinced it was the best solution. I also used it for a large streaming app with thousands of users to save the last channel they were listening to when their app timed out. So at their next login it remembered. It does delete the structures & I had a lot of issues with blowing up memory with session variables. Record page views for cart tracking / checkout progress. I think the logging situations make sense, although perhaps it would be more robust to put it in onApplicationStart(), because an application will always start, but it might not end: for example if the box itself crashes, or the JVM gets tangled-up (sorry about the technical jargon there). So there's a chance of missing some metrics doing it at the end. I understand, though, in an auditing situation "what makes best sense" is not necessarily one of the requirements. And also there's merit to be had in a "belt 'n' braces" approach. I'm not sure about the shopping cart ones. Aren't shopping carts generally session-centric, not app centric? Also an application can time out without a session timing out. If the application times out and restarts, it will re-acquire any sessions that were still around when it timed out. Obviously it'd be unusual in the normal sequence of events for the application to time out before its sessions, but it's possible if say one calls applicationStop(). Still: I will not base any sort of judgement from a quick comment in a survey, obviously I know stuff-all about the environments / codebases in question. I've prototyped the idea in my dev environment and it does seems to work nicely, though there may be hidden gotchas that I'm not aware of. Any thoughts to that approach? I've rarely had a need for OnApplicationEnd. The server should be handling garbage collection of application-scoped variables, so one shouldn't have to write that sort of logic. When I see OnApplicationEnd in lessons I usually see examples where applications log information such as the date/time when it ended. Personally, I can't think of anything useful to log when the application ends. If you really want to keep track of the application lifecycle you could always log that within OnApplicationStart and leave it at that. I'm curious to see what people say in your survey! I think with the application timeout thing - I've had similar thoughts in the past - the easiest way to mitigate it is to have a really long application timeout. This removes the issue. Bear in mind that by the time onApplicationEnd() runs, the application has already timed out, so I think if one is after continuity, then making sure it never times out, rather than re-init-ing it if it does time out is a better approach. Also if an application must be up, then there should be some sort of "are you up?" check going on to alert [someone] if the answer is "no". And the act of asking the question will reset the time out timer anyhow. Unfortunately there were no responses with some really excellent thing we can all take away thinking "hey, that's cool". But I think we all probably suspected that would be the case anyhow. Thanks for filling out the survey, to all those that did. Whilst trying to coerce Google / Blogger / Disqus to cooperate and get the comments for this blog indexed, I discovered how to enable comments on the mobile view of the site. Cool. This is mostly a follow-up from a Stackoverflow question. The question is based around some confusion arising from a blog article which offers some misinformation about how functions can cause race conditions across two requests simply by not VARing variables, or accessing the variables scope explicitly instead of using a function-local variable. To be very clear from the outset: the blog article is mostly wrong. This is a quick follow-up to that thing I mentioned the other day about the relative performance comparison of arrayFind() and listFind(). With the upcoming ColdFusion 11 pre-release, I'm going to start banging about some ColdFusion bugs that piss me off. I'll mention them as I encounter them in my day-to-day work. First up: param. There's a bug with param detailed in bug 3364510. Basically it's not been completed.